Like pasta, risotto should be cooked until ‘al dente’, with just a touch of firmness in the centre of the grain. 1. Heat the butter and oil in a large pan and cook the onions for 10 minutes until softened and golden brown. Stir in the bacon and rice and cook for 2 minutes. 2. Add the squash, tomato paste, half of the chicken stock and the thyme. Cover and cook for 10 minutes, stirring occasionally, until the stock has been absorbed. 3. Pour in the remainder of the stock and cook for a further 10 minutes, stirring until both the rice and the squash are tender and all the stock has been absorbed. Divide between 4 bowls and scatter with Parmigiano Reggiano, extra thyme and black pepper to serve. 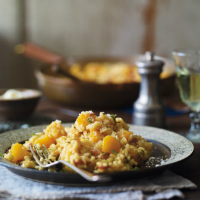 Chill any left-over risotto overnight. The following day, form the risotto into balls or patties, roll in beaten egg and breadcrumbs and shallow fry to make delicious arancini rice balls or burgers.